Mathaman Marika was an important early bark painter from Yirrkala in Arnhem Land. 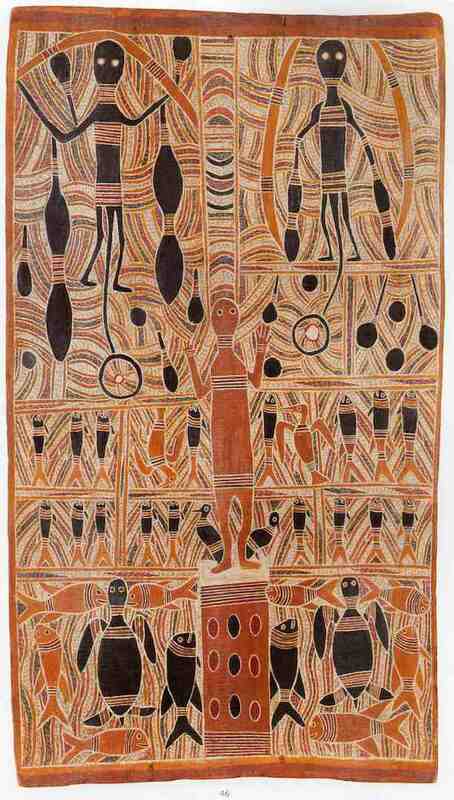 The aim of this article is to assist readers in identifying if their aboriginal bark painting is by Mathaman Marika. It compares examples of his work. Mathaman started bark painting in the early 1960’s and became one of the most sort after bark painters of North East Arnhem Land. When Mawalan his older brother died he became the leader of the Rirratjingu clan of the Dhuwa moiety. His bark paintings are depictions of different ancestor stories of his people. They include its creatures, places, and totems. If you have a Mathaman Marika bark painting to sell please contact me. If you just want to know what your Mathaman bark painting is worth to me please felt free to send me a Jpeg. I would love to see it. Mathaman painted his barks with delicate rarrk (cross-hatching). The areas of rarrk divided into inter-related sections by straight and diagonal lines. They contain motifs of figures totemic animals and geometric designs. In general, Mathaman had a love for yellow ochres and muted ochres. He was the first bark-painting artist in his region to often mix pigments. Mixing pigments softening the usual stark contrasts of colors. He did not use European wood glue as a binding agent but preferred orchid juice. This resulted in a matt finish more suiting his muted pigments. His “black” is often on close inspection a dark olive green. There is a striking contrast between his ability to do detailed Rarrk and the simplicity of his figures. Mathaman among other things has painted the Nhulunbuy stories. These include the Sugarbag Spirit, the Morning Star ceremony, and, the Wagilag Sisters. These are all legend stories of Arnhem Land. Mathaman Marika was born in 1915. He was the younger brother to another famous aboriginal bark painting artist Mawalan Marika. 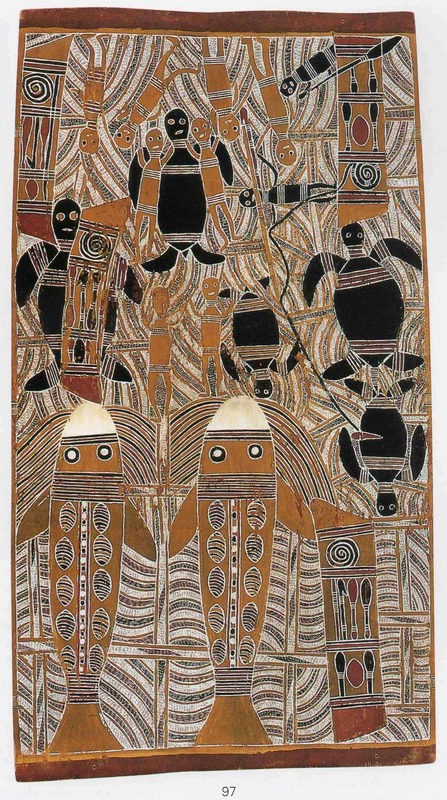 In fact, the Marika Family is a dynasty of aboriginal bark painters that continues to the present day. Mathaman was born before intensive European colonization of North Eastern Arnhem Land. He was one of the principal informants for early anthropologists. Mathaman Marika became politically active in his early 20’s and sent to for two years. He was sent to jail for a series of conflicts interrupting surveyors from a mining company. He was a major leader for the recognition of land rights for his people. 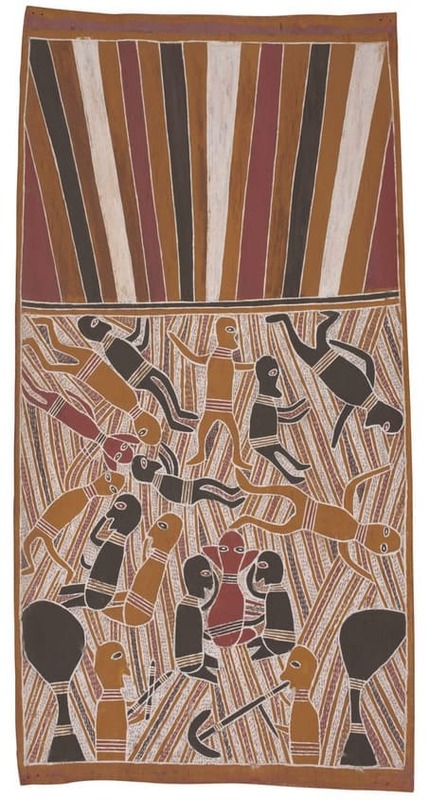 Mathaman was one of the artists involved in the painting of the Yirrkala Church panels and Yirrkala petition. Both these works are considered national treasures. He painted with his brothers Wandjuk and Mawalan. Other artists involved in painting the Yirrkala church panels include Birrikitja, Yunapinju and Mithinari. The following are images are not a complete list of works by the artist but give a good idea of the style and variety of the artist.